On Saturday, September 24, 2011, we drove the length of State Route 155, up the Grand Coulee to its eponymous garganutan dam and then through the Okanogan highlands. 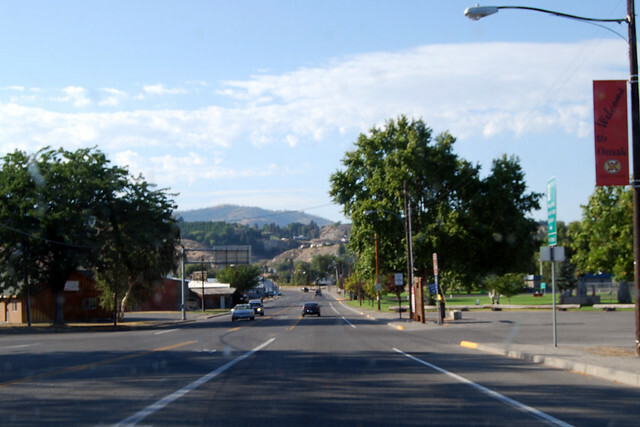 Coulee City, Grand Coulee, and Coulee Dam; Electric City, Elmer City, and Omak! 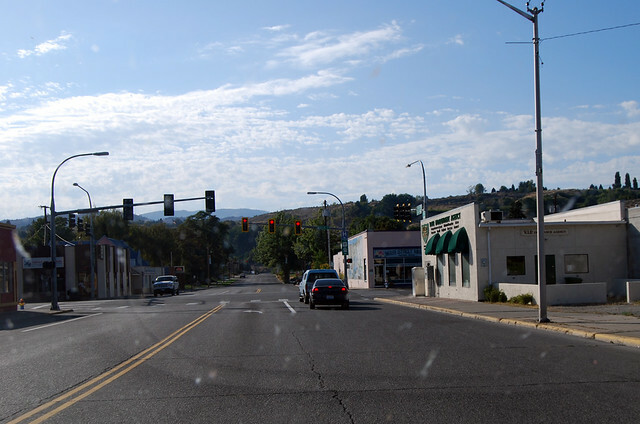 Just north of Coulee City and just east of Banks Lake, SR 155 begins at a junction with US 2. 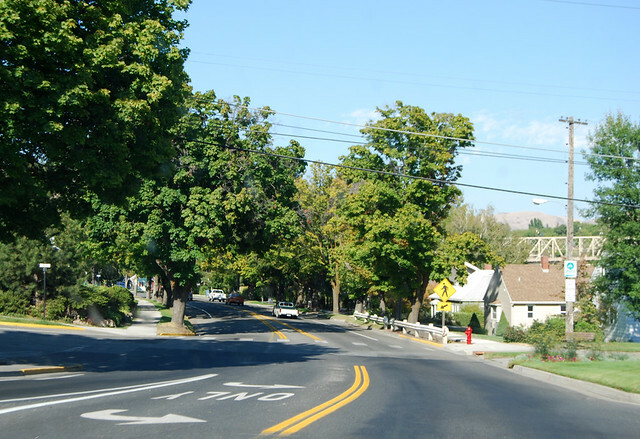 To continue east on US 2, you have to turn right. We, on the other hand, continue straight ahead. Banks Lake is an odd reservoir, with a dam on both ends. 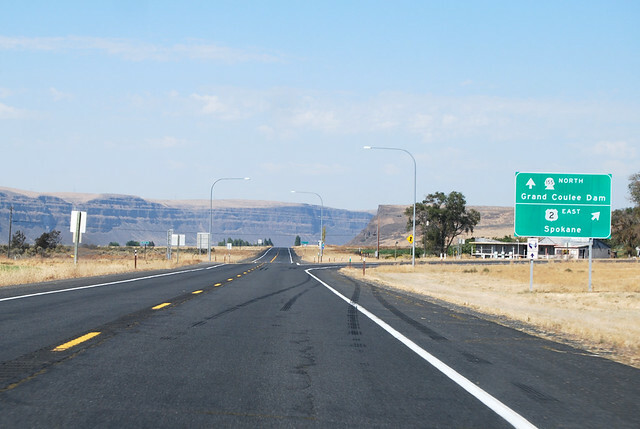 It nearly fills the full width of the Grand Coulee, leaving just a little space for the highway. So this section is quite scenic, but everything must end. 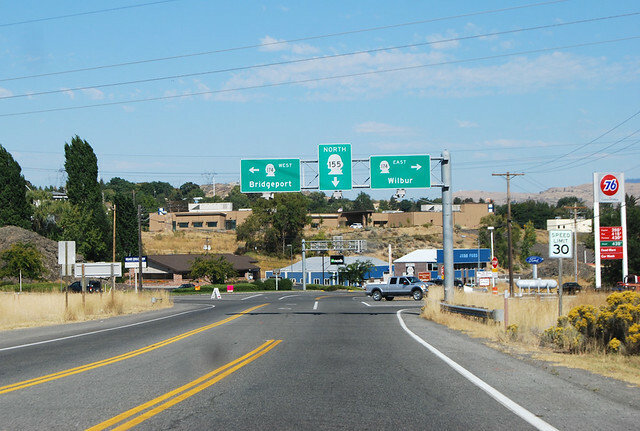 We arrive at Electric City, then the city of Grand Coulee and a junction with SR 174. 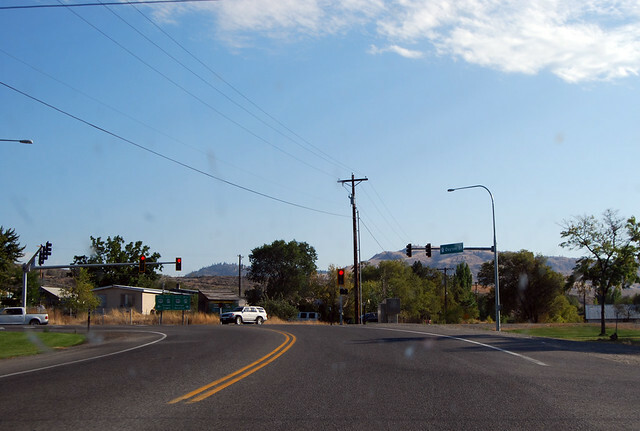 At the other end of the city of Grand Coulee, SR 155 ends (but they don't tell you!). 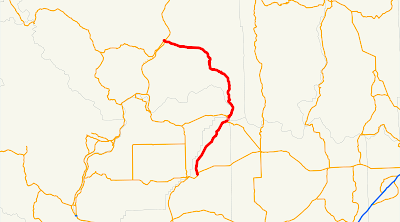 It enters the "federal reservation" which is the area around the dam. 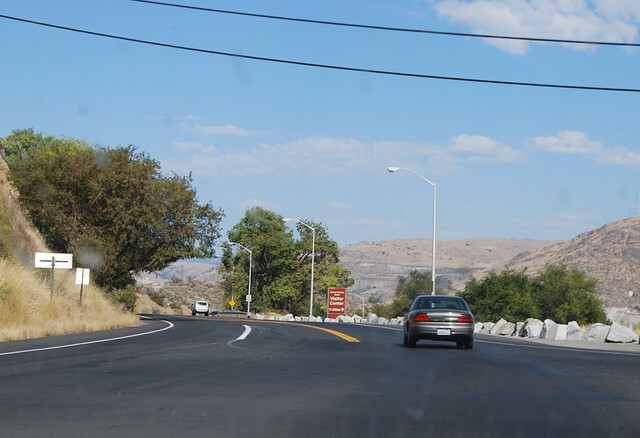 The road goes down the hill past the Grand Coulee Dam and the visitors center. We enter the city of Coulee Dam and Douglas County and suddenly this is SR 155 yet again. Do you see where the pavement changes? 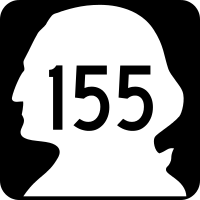 But SR 155 isn't done yet. Here we are again! Did the shadows move at all? SR 155 spur continues straight where SR 155 turns left. Still in Omak. 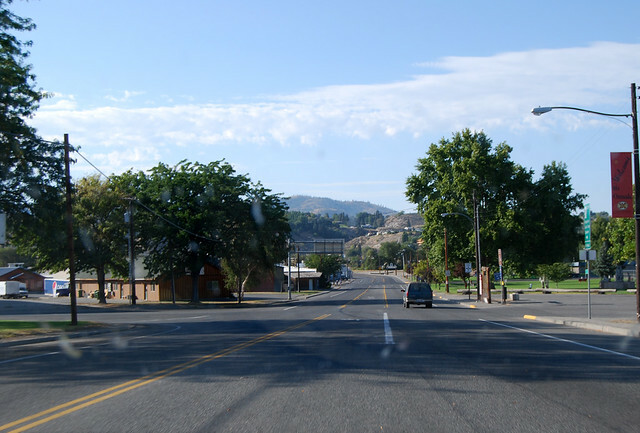 A few blocks later, we cross the Okanogan River to the heart of Omak. SR 215! That quickly, SR 155 is done. Highway 155 seem like two very different roads. One is through a huge canyon beside a giant lake. 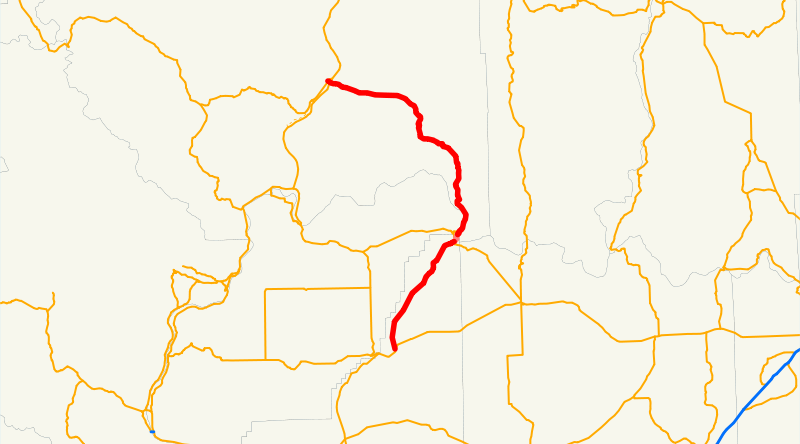 The other crosses the Colville Indian Reservation through fields and forests. A giant chunk of engineering history tie them together.